So last month, our sister in low-level-programming arms, Stephanie Hurlburt, collected a list of experienced software engineers willing to mentor less experienced ones. The very first person on the list caught my eye. It was Alex Evans of Media Molecule, a studio that has used voxel techniques for global illumination for previous games and which was currently working on "Dreams," an insanely cool creative artistic sandbox game for the PS4. If anybody knew how to take the graphical presentation of a Minecraft clone to the next level, it would be him. So I asked him and he accepted! 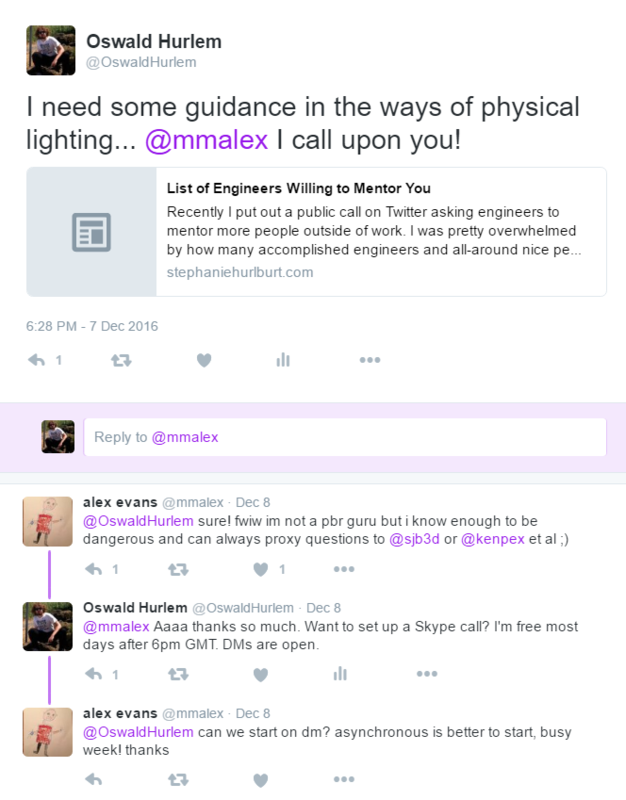 Note that at the time I believed that "physical lighting" specifically referred to volumetric lighting. In reality, what I want to accomplish with my game and what "physical lighting" means are two circles on a Venn Diagram with a moderate overlap. You can read our correspondance here. In it, we discuss how to get started learning physically-based rendering (PBR), voxel cone tracing, light propagation volumes, and more. Alex's "meatiest" reply describes how to perform voxel cone tracing. This has been a tremendously helpful experience, so a big Thank You is owed to Mr. Evans for his help and to Miss Hurlburt for helping us get in touch.